You may know that Japan is made up of many different islands. You may not know that there are a total of 6,852 islands in the Japanese archipelago! Here are some more interesting numbers: Only 430 of the Japanese islands are inhabited. However, the entirety of the population (97%) lives on just 4 islands: Honshu, Shikoku, Kyushu and Hokkaido. 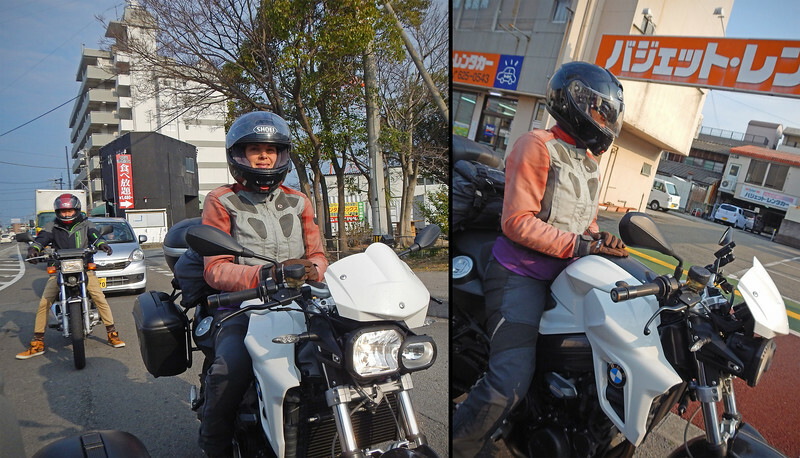 All this time, we have been riding around on the main island, Honshu, where Tokyo is located. Honshu is the most populated island. 80% of the population resides here, concentrated in the large cities of Tokyo, Osaka, Kobe, Kyoto and Nagoya. In fact, close to half of the entire Japanese population is packed into just 17% of the land area! This last statistic is borne out by our motorcycle travels through Honshu. Once we are out of the cities, the landscape opens right up. Vast tracts of mountainous land lay out all around us with few people or vehicles around to be seen. The myth that Japan is super-crowded is only applicable to small pockets of tight urban centers. Although we've already taken one ferry, it was to cross Suruga Bay to bypass the Fuji megapolis. Ferry-bypasses are a fact of life when traveling on the big island because the cities are just so congested to attempt to drive through, and the route across the water seems to be priced about the same as taking the ETC toll expressways. 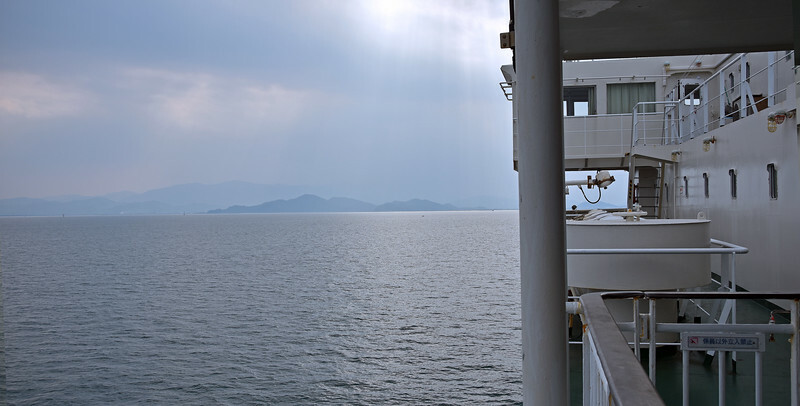 However, now that we are leaving the island of Honshu, we're really looking forward to experiencing a lot less traffic and more open spaces! Bye bye, traffic! Farewell ETC! 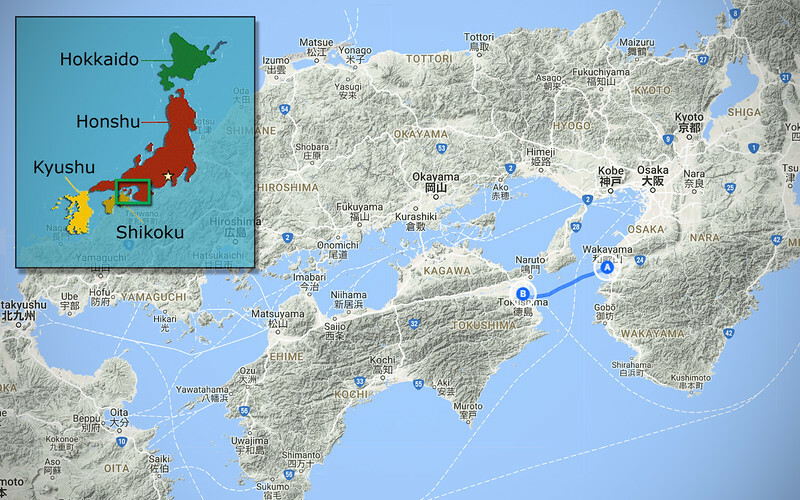 It takes about a couple of hours to get from Wakayama on Honshu to the city of Tokushima on Shikoku island. Plenty of time to catch a nap on the floor! 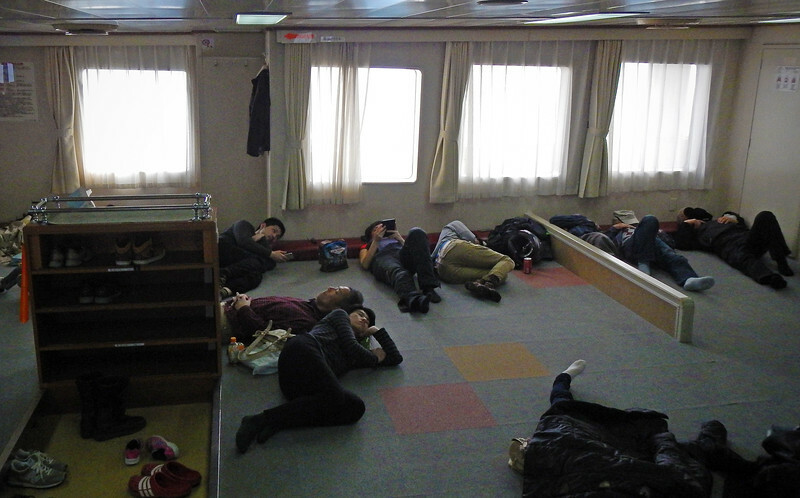 Japanese people are so used to sleeping on the floor in their tatami rooms at home that the ferry companies always have to have a sleeping area on their boats, even if they're not lined with tatami mats. There's even a little raised platform on the edges that you can use as a headrest or pillow. 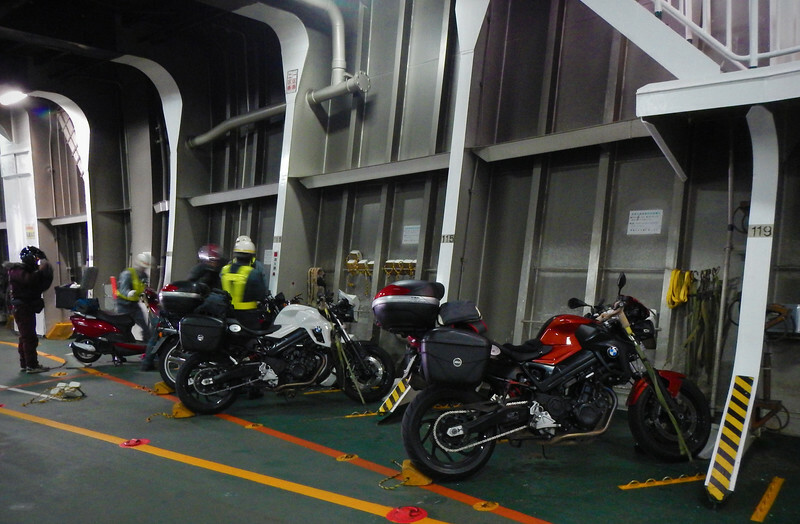 What that means is that all the motorcycles are stuck behind the lineup as we ride into the city of Tokushima. An American car in Japan. A *VERY* unusual sight! 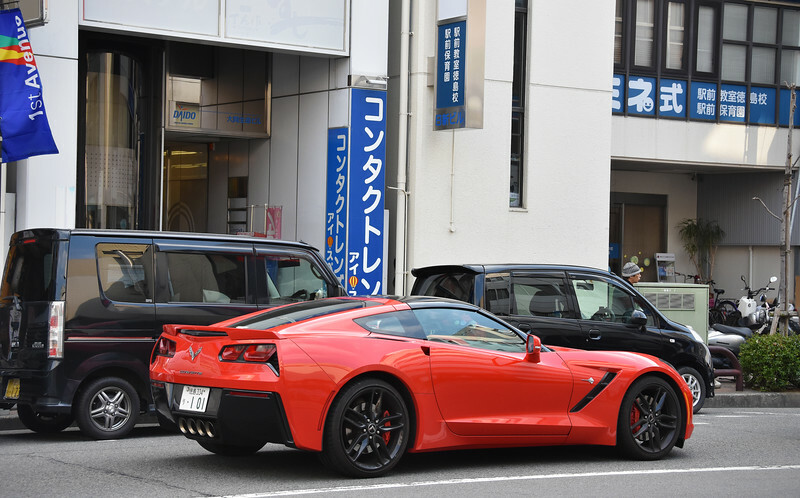 You can see, behind the Corvette, the everyday cars of Japan. Very boxy, very utilitarian. *Very* space-efficient! Just the other day, we were chasing down a cool-looking black coupe racing down the expressway. It was a car I've never seen before, and when we pulled up beside it, I saw that it was some kind of Mazda. When I checked online later, I found out it was a hardtop version of the Miata called the RF. They just announced it a few months ago. I don't even think it's available in North America yet! I wish I had taken a picture of it. I remember in Thailand, we saw the CRF250 Rally when it first came out a couple of years ago. Because Honda manufactured them right in Thailand, we got to see them on the road before the rest of the world did. I love being at Ground Zero when new cars and bikes come out! 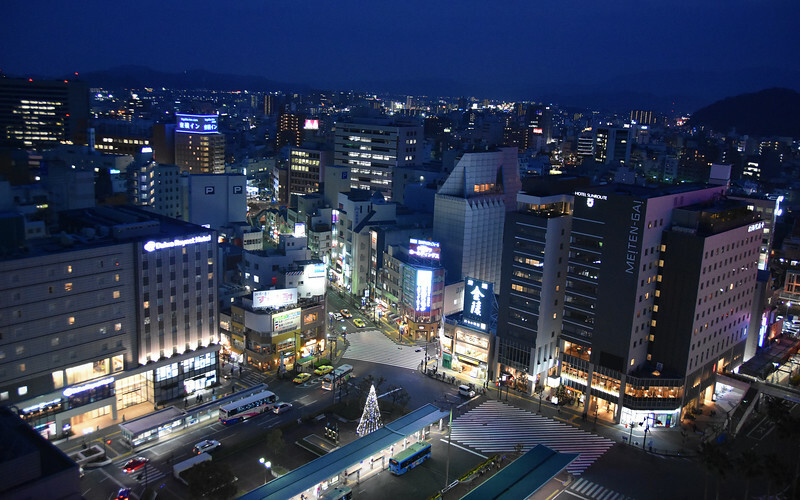 Although Tokushima is one of the larger cities in Shikoku (population ~260,000), it's nowhere as large as Tokyo (population ~13,000,000! ), and the traffic is so much lighter here! 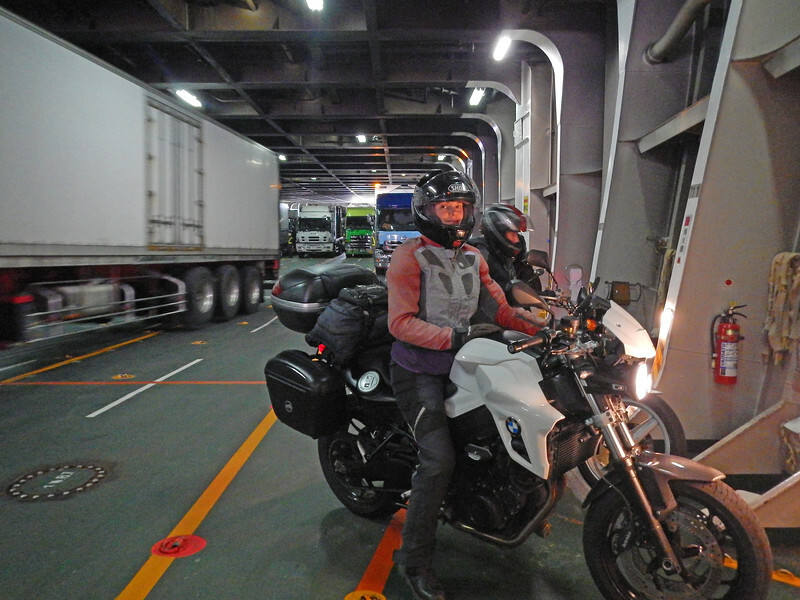 This blog entry won't be too long because we are taking another rest day before we explore the rest of Shikoku. We were travel fatigued even before we got to Japan, so we want to make sure our journey through this magical country is as leisurely and stress-free as possible! 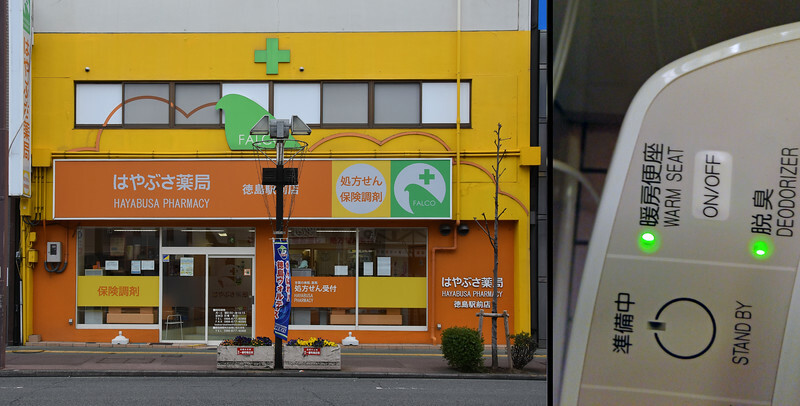 The fastest production pharmacy in the world! Also, in the city, there are more English labels here. Like on the toilet seat in our hotel! Finally we can decipher what some of the buttons in the super-hi-tech toilets (called washlets) do. Japan's washlets have become world-renown for their array of comfort features. Most of the technology is embedded in the toilet seat, and you can retrofit your existing toilet by just buying the seat. Basic heated seats cost $200. The top-of-the-line full toilets with bidet sprays and wireless remote controls can cost upwards of $10,000 USD! There's a bit of an arms race between the manufacturers to see who can pack the most features in their washlet seats. 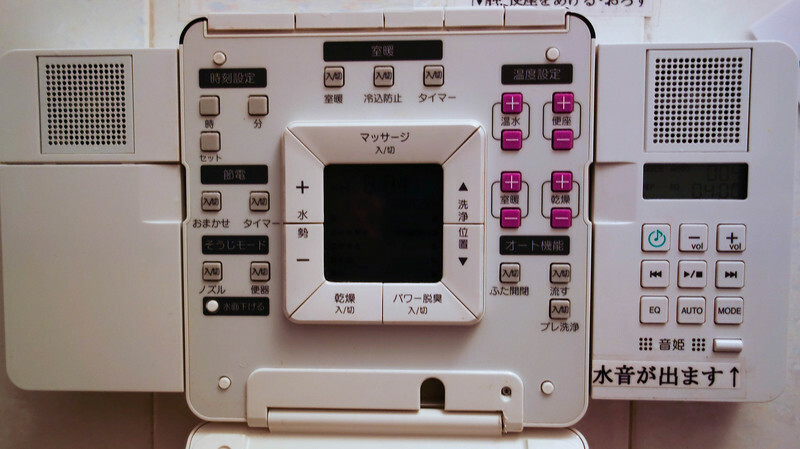 It's gotten so bad that the industry has been forced to come up with universal icons for each feature that all the manufacturers must use because gaijin like us can't read the descriptions written on the buttons. The name of this model roughly translated to English is, "Good Luck, Gaijin!" Add to this: energy-saver features like only turning on the heat only when someone enters the washroom (basic heated seats are on all the time). Automatically opening and closing lids. Also, self-cleaning nozzles. This last feature is nicknamed the "Marriage Saver". There are some really expensive, touristy restaurants around the hotel, but with a little poking around, we manage to find some places within our budget where the locals also go. Over the next couple of days, we find a great ramen place, and also a cafeteria-style Japanese curry house. Walking around town, we spot a couple of figurines on a pedestal. They look like they're doing some kind of martial arts? And then further on, we see the same figures in silhouette on the road. 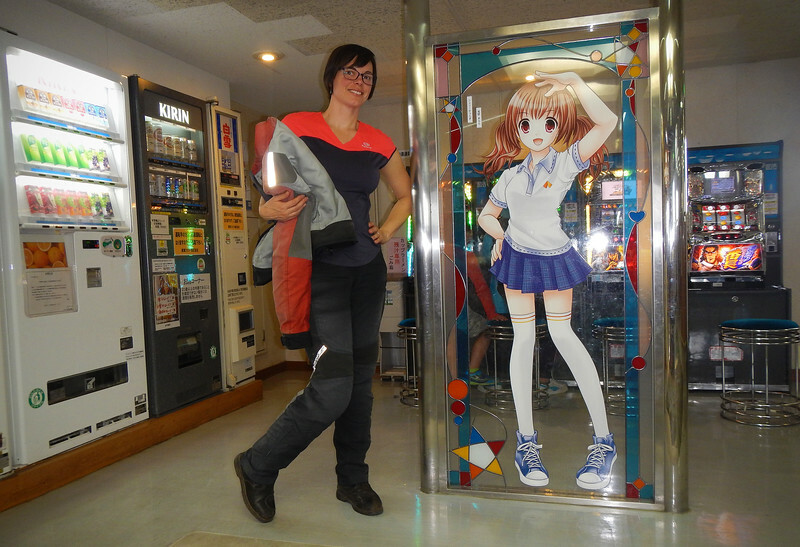 Is this a special thing in Tokushima? Upon closer inspection, these two figures were everywhere, on store windows, posters, etc. 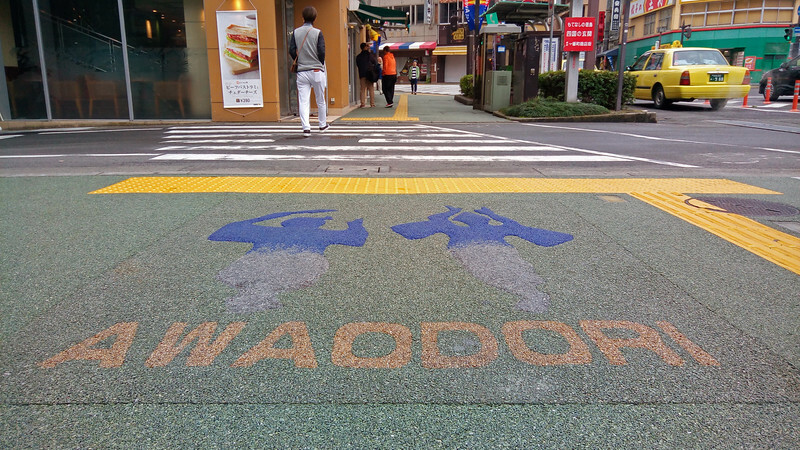 I looked up "Awa Odori" on the Internet and discovered that Tokushima is the site of an annual music and dance festival, held at the end of every summer. Legend has it that in the 1500s, a feudal lord sent sake out to all the villagers to celebrate after completing construction of his castle in Tokishima (which back then was called Awa). The villagers all got drunk and started stumbling through the streets in a haphazard fashion. From then on, every year people danced on the streets in drunken fashion. 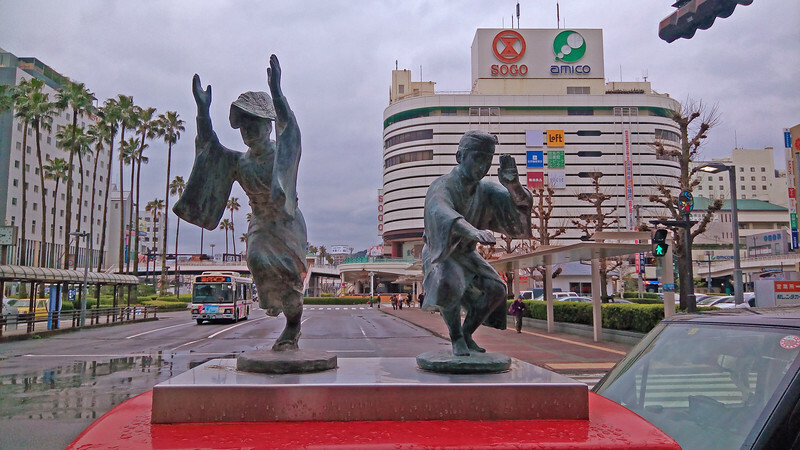 There's a specific dance movement, which requries raising your right arm and right leg, then your left arm and left leg, exactly like those figurines found all over the city. These days, hundreds of dancers will take to the streets dressed in colourful costumes. Tens of thousands more come from all over the country and the world, all to take part in the annual drunken dance. Because it's not enough just to spectate. During the dance, everyone chants in Japanese, "It's a fool who dances and a fool who watches! If both are fools, you might as well have fun dancing!" HAHA! So cool!!! Just like the huge Fire Festival in Kumano, we are slowly finding out that Japan is home to dozens of these crazy festivals held all over the country at various times of the year. We've now made it a mission to see and take part in at least one of these over-the-top festivals during our trip. It's the next item right after Neda's "Cherry Blossom Festival" on our Japan bucket list! That was an excellent rest day in Tokushima. We're off to explore Shikoku now!